I've had the privilege of serving on Austin Habitat for Humanity's Board of Directors for the past 3 years and have had the opportunity over the past 6 years to volunteer here in Austin and abroad. 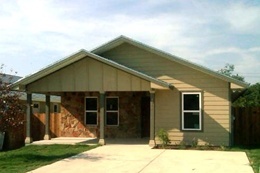 I’d be honored if you would consider joining me in the fundraising efforts for the 2011 Directors’ Build - which will be the 300th Habitat House here in Austin! Consider sharing a "hand up" with another hardworking Austin family and help them realize their dream of homeownership!! The wallraising is scheduled for May 7 and if you are interested in building with us then or in the 10-12 weeks following, hand-in-hand with our partner family, I’m happy to reserve a place for you. Andrew and I always have a great time building and would love for you to join us!! "Thanks for supporting a great cause, Robbi!" "Robbi - Thanks for all you do for Habitat! You are (as always) and inspiration." "Good luck hitting your goal!!! Joe and Jonathan." "Happy to support you & a good cause. We are proud of your Habitat efforts here in Austin and all over the world! Love, Dorian & Griff"
"Good luck meeting your goal!" "Good luck, Robbi! Thanks for letting me be a part of your wonderful efforts for Habitat!" "Thanks for the work that you do Robbi! Love Scott and Marcy"
"Blessings for a successful fundraising effort. Mary "
"Always happy to support such wonderful work in any way possible!"